There were several sources that claim that Posada Art Books have closed. Allegedly, you can still buy some books (perhaps the remainders). Contact them by email for more info. Sean said: "Located in a dear old house near St Magdalen's church in Brussels, Posada Books is as famous for its pretty interior as it is for its collection of new and second-hand art books. Has a remarkable collection of exhibition catalogues, which goes back to the beginning of the last century, and holds occasional exhibitions too." 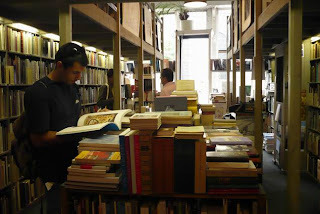 Posada Books is said to be the best Belgian art bookstore - they have almost anything on any art subject. This bookstore truly managed to impress us during our visit as the scope of its stock is really amazing. It is also famed for its stunning interior - every inch from the floor to the ceiling is stacked with books - and best of all, it is a second hand bookstore, although new books can be found here as well. The books are not categorized by language, but many books in English can be found among books in French, Dutch and other languages. Of course, art is the focus of this business, and in that domain, it stores just about everything from contemporary art books to exhibition catalogs from the beginning of the last century. 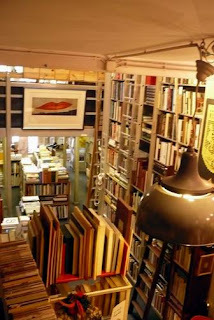 This bookstore is a delight to anyone interested in visual arts and a true gem in its category. Posada Art Books is located in the center of the Belgian capital Brussels, in a street where several other bookstores can be found. But Posada with its huge windows simply cannot be missed. The interior of the bookstore is just as impressive as the exterior. This is one of the few bookstores where it may actually be possible to get lost while browsing. Just discovering more and more sections of this bookstore dedicated to a specific branch of art on one of its floors is a true adventure. As for the stock, there's no need to go into details, basically all subjects related to visual arts are very well covered. Due to the fact that Posada also sells second-hand books, you can find many older and out-of-print rarities. The bookstore is closed on Sunday and Monday.